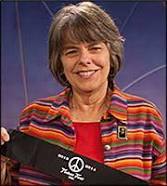 Mary Beth was 13 when she was suspended for wearing a black arm band to protest the violence of the Vietnam War. In the ruling, the Supreme Court upheld the First Amendment protections for students by stating that the school could not censor student speech unless it disrupted the educational process. Mary Beth continues to educate young people about their rights, speaking frequently to students groups across the country. An advocate for the rights of youth, particularly in the areas of health and education.